Chloe Saunders sees dead people. Yes, like in the films. The problem is, in real life saying you see ghosts gets you a one-way ticket to the psych ward. And at 15, all Chloe wants to do is fit in at school and maybe get a boy to notice her. But when a particularly violent ghost haunts her, she gets noticed for all the wrong reasons. Her seemingly crazed behaviour earns her a trip to Lyle House, a centre for disturbed teens. 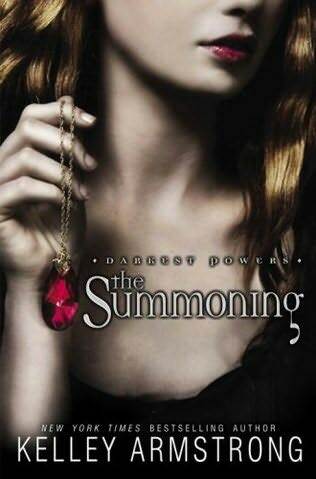 This is the second time I have read The Summoning by Kelley Armstrong, the first in her Darkest Powers trilogy, as a re-read in preparation for the next two that I hadn’t read till now, making it hard to review with the same amount of enthusiasm as someone who had read this without knowledge of it. Yet maybe it’s a good thing because I enjoyed it thoroughly the next time round, haven’t changed my rating or opinion on it either, and surely that must tell you it is a readable story? It’s one of those books, at least to me, where it is such an easy read. It goes so fast, it’s like you’re sucking the words up akin to a vacuum cleaner. That doesn’t necessarily mean it is a light read, albeit it is lighter than most (such as classic lit for instance), but it still delves into a few darker and heavier issues such as ostracism. Granted that is almost in every young adult novel, or at least the pressure of feeling outcast when they are not, and yes it is in a lot of books that aren’t young adult, but I think I appreciate the delivery more compared to a lot of other novels. However, I think when it comes to the use of ostracism in a novel, it’s a ploy that is so worn out that it can be too overly done in a story and ruin it. I like how Armstrong takes it and uses it in this scenario though without a major emphasis on it. The emphasis feels more like an internal struggle of acceptance, and when it involves acceptance, it doesn’t take that long before the characters start getting there. Of course there’s always something going on, but it’s nice when a novel has some intrigue and you don’t learn everything about the characters – personality or otherwise – before the end of the book. I probably wouldn’t keep reading otherwise. Basically it’s a pretty good read. It’s entertaining, easy to absorb and be taken in by, has enough intrigue to keep you reading, and I think it has just the right amount of supernatural without being saturated (sometimes that’s better). Demographic: Mid-Late teens, but good for Adults as well. Reminds Me Of: I’m sure there’s something Urban Fantasy-esque out there that involves an institution of some kind.